A very unique piece hand made in Madeira. 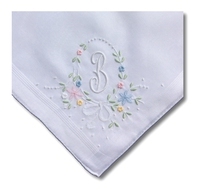 Soft white Swiss cotton 14" with a Taupe multi layer applique. You cannot see it from the photo but this has petals that are loose to give it more dimension. 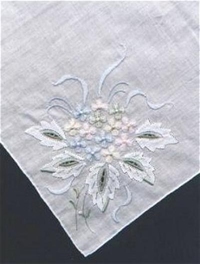 Small flowers embroidered in the other three corners. Available in other colors as well. A very unique piece hand made in Madeira. 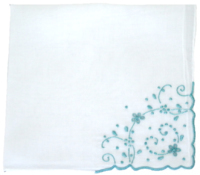 Soft white Swiss cotton 14" with a grey multi layer applique. You cannot see it from the photo but this has petals that are loose to give it more dimension. 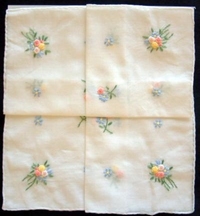 Small flowers embroidered in the other three corners. Available in other colors as well. A very unique piece hand made in Madeira. 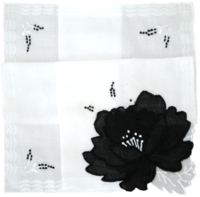 Soft white Swiss cotton 14" with a black multi layer applique. You cannot see it from the photo but this has petals that are loose to give it more dimension. 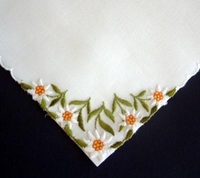 Small flowers embroidered in the other three corners. Available in other colors as well. 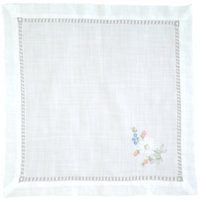 Soft white Irish linen enhanced with beautiful Madeira hand embroidery including extensive seed stitching and scalloped corner. 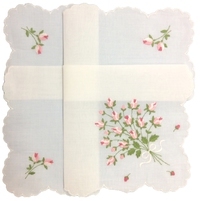 14" square, real old timey quality. 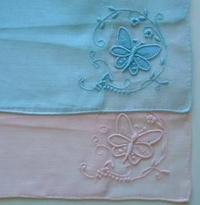 This style has it all, Flowers, Butterfly, Scallop and Openwork. 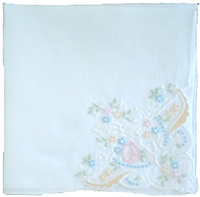 14" soft white cotton hand made in Madeira with hand rolled hem where the scallop stops. 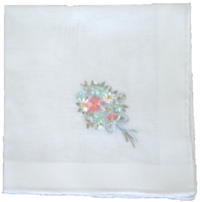 A Classic white cotton 14" handkerchief hand embroidered in pretty multi color embroidery. Hand done in the Isalnd of Madeira. 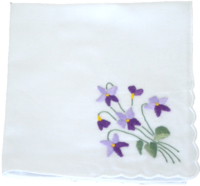 A lovely Irish linen with a lot hand embroiderey, fill work and seed stitching. Scalloped corner and hand rolling on the hem. Comes in Multi embroidery and all white. 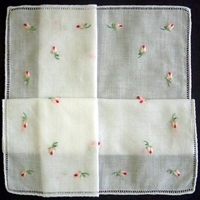 Hand embroidered in Madeira, 14" square, Irish Linen. This is a timeless piece. 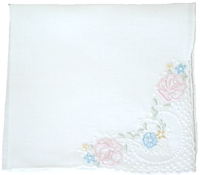 Roses with seed stitching and embroidered Swiss dots framed in a scalloped corner make this a classic. 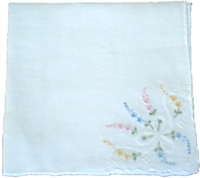 Hand embroidered in Madeira on Irish linen, 13" square. 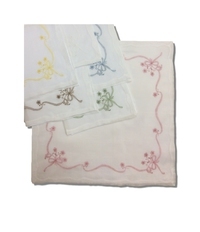 Swiss embroidered pastel yellow and green Daisy on soft white Swsiss cotton. Scallop on scalloped hem. 13" A true Swiss classic. 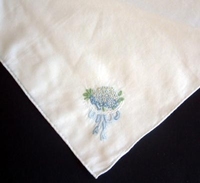 A Classic wedding Handkerchief. 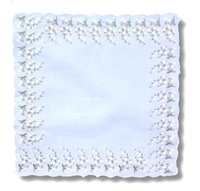 11-1/2" Pale Blue Cotton Lawn Emroidered with a White Bouqet of Lily of the Valley. Finished with a White Scalloped hem and Perfect for any Wedding. Made in Switzerland. Also available in All White, Style 684. 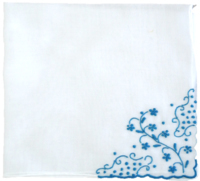 Soft White Swiss Cotton Hand Embroidered in Madeira with a White letter with blue flowers. 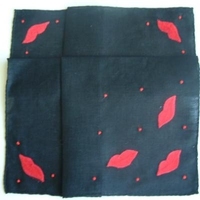 Hand Rolled Hem and measures 14" square approx. 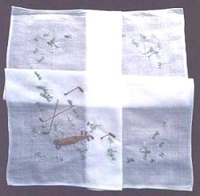 Embroidery measures 2" x 2" approx. Also Available with Pink Flowers, please see 400 Pink. 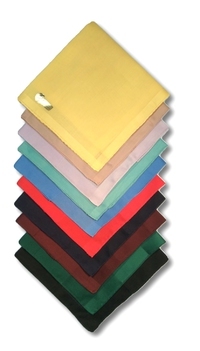 Swiss Cotton Hand Rolled in 10 Beautiful Colors. Features a Subtle Tone on Tone Band. 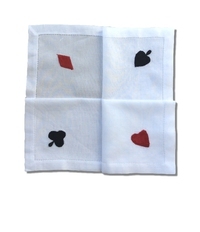 Perfect for Monogramming or as a Pocket Square. Please choose your color. Our Traditional Heart Pattern. 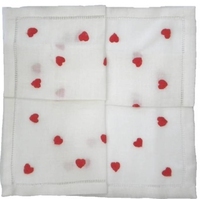 Red Hearts Hand Embroidered on a Soft White Linen with Hemstitch Edge. Measures Approx. 12 inches Square. 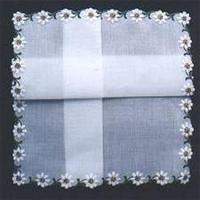 Beautiful Swiss Flowers Hand Embroidered on a White Cotton and Linen Clipcord Handkerchief. 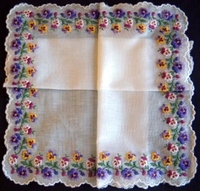 Hand Embroidered in Madeira, Measures 14 inches approx. 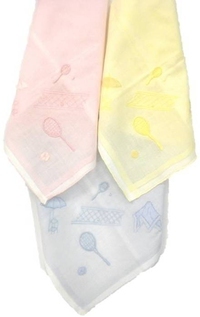 A Swiss Cotton Pastel Handrolled Handkerchief with a Subtle White Stripe and Hand Appliqued in a Tennis Motif. 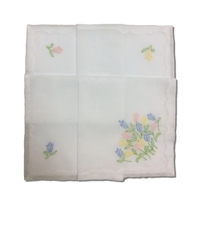 This Handkerchief is also Available Plain. Measures 12 inces approx and is Hand Made in Madeira. Priced each, Pick Your Color. 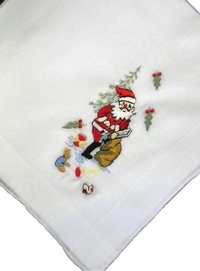 A soft cotton embroidered in Christmas patterns. Available in Candy Cane, Holly, Bell and Christmas Tree. The Perfect Little Christmas Gift. Measures 11" approx. Please select pattern. 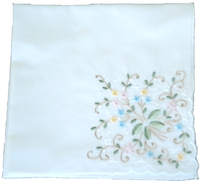 Embroidered in Portugal with Hemstitched edge. 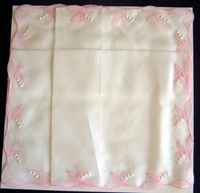 All White Cotton and 12" Square. 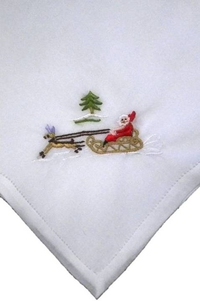 The Perferct Gift as Santa's on His Way! 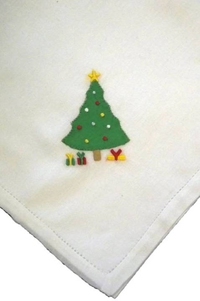 Hand embroidered appliqued Christmas Tree complete with gifts. 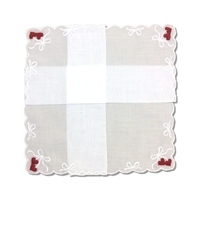 All cotton, hemstitched, and made in Portugal Hemstiched Hem, 12" square. 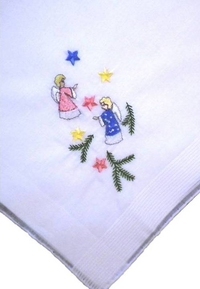 The Classic Angel Handkerchief we have had for years. 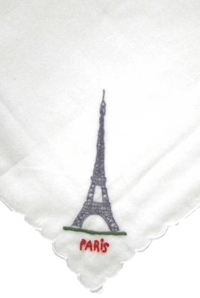 Designed in Switzerland, All Cotton with a Rolled Hem. the Perfect Gift for your Angel. 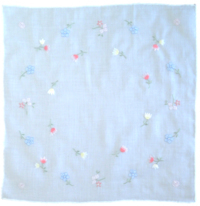 13" Square. 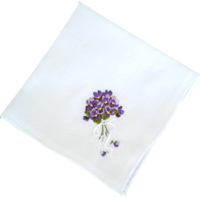 Lovely Violets Embroidered on White Cotton with Rolled hem. 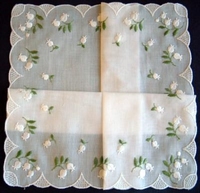 Measures 13-1/2 inches Square. 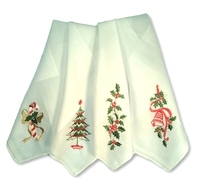 A Classic Swiss Style Embroidery everyone Loves. 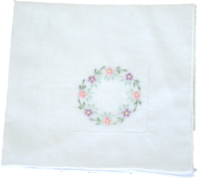 A Nice Soft White Linen/Cotton Blend, Hand Embroidered in Your Choice of 6 Colors, All White, Pink, Blue, Taupe, Sage and Yellow. Measures 14-1/2 inches and has a Beautiful Replique Hem. A True Heirloom. 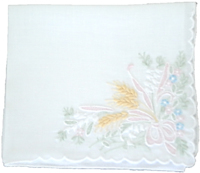 A Beautiful Soft Swiss White Cotton with Lovely Tulips Hand Embroidered in a Shadow Style in Spring Pastel Colors. Major Bouquet in one Corner and Single Tulip in the Other three. 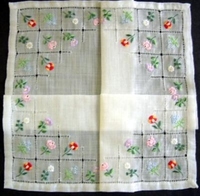 Measures 14 inches Square and is finished in an Unusual Replique Hem. 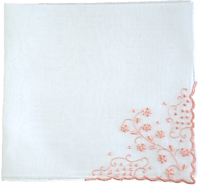 A Soft White Linen/Cotton Blend Shadow Embroidered All the Way Around in a Ribbon and Floral Pattern. Available in 6 colors, please specify. Measures 13-1/2 inches and is Finished in an Unusual Replique Hem. The Card Players Favorite. 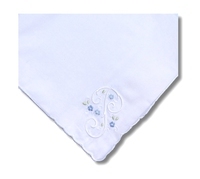 Soft White Cotton with Applique Card Suits Finished with a Beautiful Hand Done Hemstich Hem. 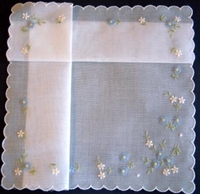 Measures 15 inches Square, Hand Made in Portugal. 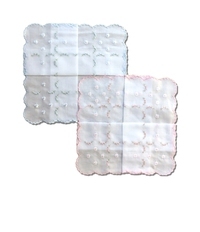 White Swiss Cotton Embroidered with Pink or Blue Flowers with Matching Scallop and Mint and White Accents. Please choose your color. Measures 12 inches approx. Made in Malaysia on Swiss Looms. 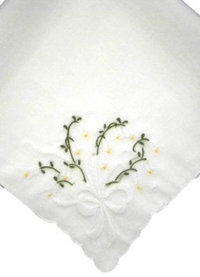 Here is a Beautiful Swiss Made White Soft Linen Lily of the Valley design. 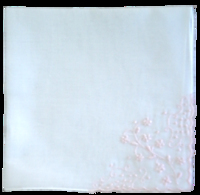 This is a Timeless Pattern that is Perfect for the Bride, Mother of the Bride or Bridesmaids. 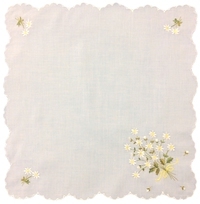 Measures 12 inches square and finished with a Scallop Hem. 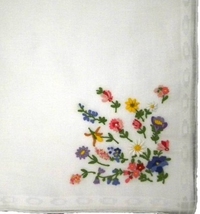 Napoleonic Bees hand embroidered on all linen hamstitched handkerchief. Swiss cotton with Madeira applique flower. Other colors available. 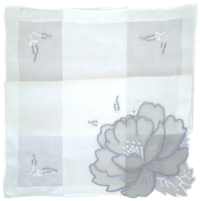 Swiss cotton and organdy with applique. 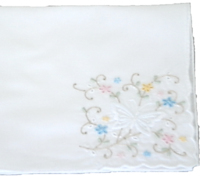 Hand embroidered and rolled in Madeira. Multi color floral bouquet. All cotton, handrolled. 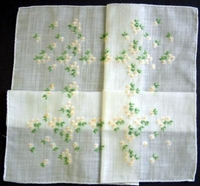 Swiss Lily of the Valley pattern. All cotton with scalloped corner. 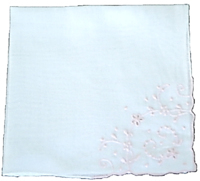 Very fine quality pink or blue linen hand embroidered in Madeira. 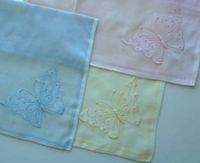 Butterfly wings literally float off the handkerchief. 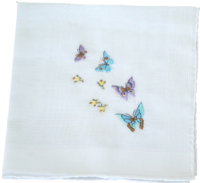 Satin applique butterfly. 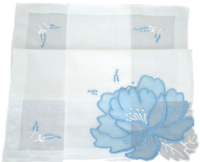 All cotton, handrolled, hand embroidered in Madeira. 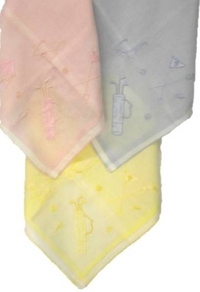 Available in pink, blue or yellow. 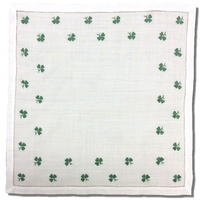 All cotton, 2 patterns assorted shamrocks. 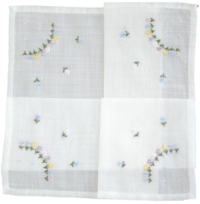 Soft Swiss cotton embroidered with petit flowers in either pink or blue. measures 12" approx, made in Switzerland. A Simple Christmas Candle. 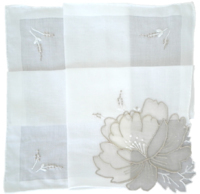 Soft 100% Swiss Cotton with Hemstitched Edge. 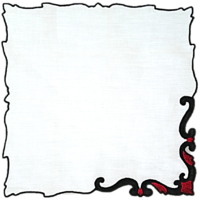 Embroidered in Portugal, 12" Square. 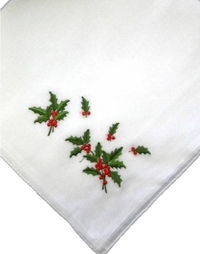 The Classic Holly 100% Soft Cotton, Handrolled Hem Measures 13" approx. Swiss Designed and a Perfect Gift. Here Comes Santa Claus. 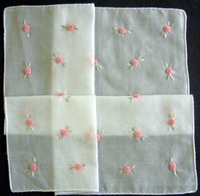 Swiss Design, Soft Cotton, 13" Square with a Handrolled Hem..
Cotton with hemstitch and rosebuds. 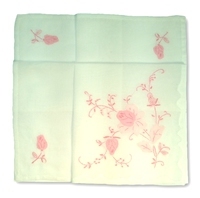 Swiss embroidered pastel pink rosebuds on soft white Swsiss cotton. Scallop on scalloped hem. 13" A true Swiss classic. 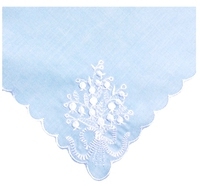 100% cotton scalloped handkerchief available in pink, blue or white. 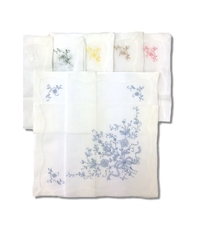 One of our best, This handkerchief features Multi color embroidered Alpine flowers and drawnwork on a soft Linen cotton blend. It measures 13" approx and is hand made. 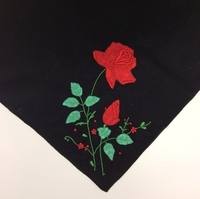 Black Cotton with Red Satin Applique Lips. 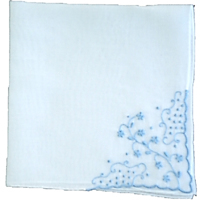 A Stunning Break from the Traditional White Handkerchief. 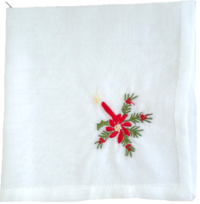 Hand Made in Portugal by Skilled Needleworkers. Hand Rolled Hem of Course. Measures 14 inces. Cotton with multi color roses. 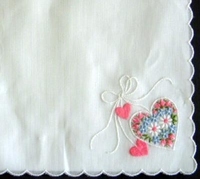 Several different types of embroidery including some Beauvais embroidered flowers. Sure to attract many compliments. 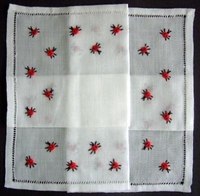 Linen handkerchief with ladybugs all around. 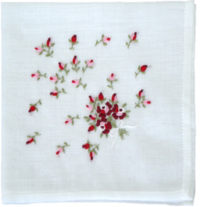 Legend has it that ladybugs are lucky, this handkerchief is sure to provide good luck with ladybugs embroidered on a linen hemstitch. 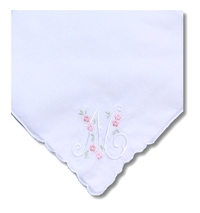 Soft Cotton with appliqued and embroidered pink Roses. Has one major corner and smaller flowers in the other three. Finished in a hand done Replique hem and measures 13" square. 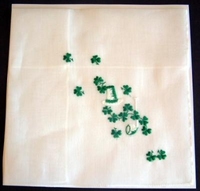 Shamrocks Hand Embroidered on Soft White Linen. Perfect for Good Luck. Finished with a Hand done Hemstich Hem Measure 12 inches Square. 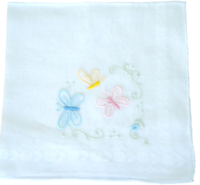 A Soft White Cotton with Hand Embroidered White Initial Surrounded by Multi Color Pastel Embroidery. 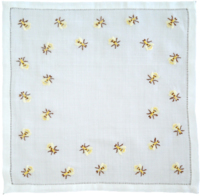 Hand Embroidered in Madeira on a 100% Swiss cotton Handkerchief with a Hand Rolled Hem. 18 letters for a personalized gift, Pick your Letter. Embroidery measures 5" x 5" approx. 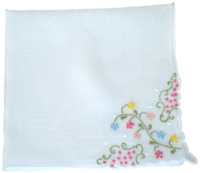 Measures approximately 13-1/2 inches square. Made in Portugal. Every bride needs "something blue". 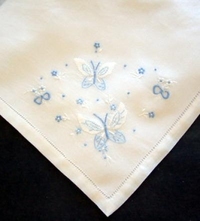 A pretty little cotton handkerchief with a nosegay of blue flowers and blue ribbon.